This past Sunday my sermon was about 1st Corinthians 11:2-16, where Paul talks about women in worship. After giving the sermon, we had an excellent time at sermon discussion group. I want to review some of the questions we talked about. If I could summarize what Paul says about the role of women in the church it seems that he is teaching egalitarianism in complementarian clothing. What do I mean that I think Paul is teaching egalitarianism in complementarian clothes? Because the culture in Corinth, and really in the whole Roman Empire, was extremely patriarchal, women were most often viewed far below men, sometimes as possessions, sometimes lower than animals. So when the women in the church at Corinth started behaving in an extremely counter-cultural way, perhaps removing their veils, perhaps cutting their hair to look like men’s hair, Paul knows that this behavior could marginalize the church and it’s influence for the mission of Christ. Basically, if the church gets the reputation for having out-of-control women, likely very few people would want to be a part of the church. Therefore Paul tells the women to act in a way that is in keeping with cultural norms. But he doesn’t stop there. Right in the center of the passage, verses 11-12, he clearly explains that men and women are equal in God’s eyes, a radical notion for the men of that culture! Do you see what Paul does there? By asking the women to maintain a complementarian approach to worship, Paul preserves the deeper teaching of egalitarianism for the future! It is a move of genius that lays a foundation for a very different approach to the role of women in the future. We see Paul’s teaching bearing fruit in our country today. In the USA we believe that men and women are equal, though we still have work to do! One issue, for example, is women not receiving equal pay for equal work. Going back to what Paul was teaching, I think Paul was a radical feminist. Look at the place he gives to women in Romans 16. 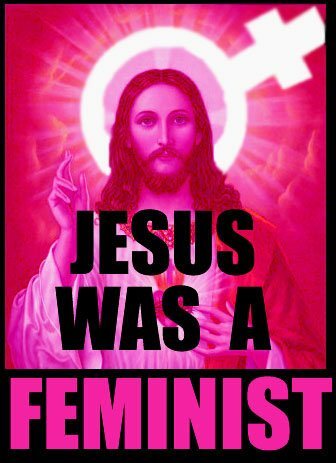 I think Jesus was a radical feminist. Look at the all the ways he dignifies women and includes them in his ministry. One person calls Christianity the best thing that ever happened to women. When we look at Jesus and Paul from the vantage point of our culture, it can be very easy to think that they could have done a lot more to enhance women’s rights. Why didn’t they teach more clearly that women should rise up and take their freedom?, we wonder. But seen from the viewpoint of the Ancient Near East in the first century AD, Jesus and Paul were egalitarians, pro-equality for women, in their teaching and ministry practice! What this says is that Paul’s teaching to the women to cover their heads, to have long hair, and to learn in quietness in the church, was intended as temporary, for that church in that culture to maintain its viability and thus to advance the Gospel. Clearly in Romans 16, Paul refers with gratefulness to the women who were serving well in various roles in the church. This is evidence that perhaps even Paul didn’t feel his teaching to the Corinthians (and similar things he would say to the church in Ephesus in the letters to the Ephesians and to Timothy who pastored there) was universally applicable. Therefore, if a church is located in a cultural situation such that men and women are considered equal, for example a cultural situation like ours in the USA, we can, and I would say should, practice egalitarianism in the church. The battleground is whether or not Paul’s teaching here in 1st Corinthians is for all time, all churches everywhere, or just for the Corinthians in their time. I believe Paul’s was complementarian teaching for the specific situation of that time, while laying an egalitarian foundation for very different cultural situations then and in the future. If that is true, is it possible that complementarian teaching and expression might actually be a hindrance in our egalitarian culture? Given the godly, deeply scholarly evidence for egalitarian approaches to ministry and the church, why do some people hold on to complementarian approaches, approaches which by their nature lower women? I have read numerous complementarian approaches by men who love their wives and want to promote equality for women. I give them credit. Deep down they are trying to be faithful to how they read the Scripture. I’m not trying to tear them down. I know women who hold to a complementarian approach as well. They love the Lord and are deeply passionate about serving him. So please know that when I ask the questions above, I ask them in a spirit of love. Our desire to get people to come to us, rather than us going to them. Being so busy about our lives that we have little or no time for neighbors and friends. An expression of church that is legalistic, rule-based. Asking people to conform to our rules before being a part of our fellowship. I am reading a book called Torn by Justin Lee wow does chapter 12 and 13 really hit this issue, I wish I could include them in their completeness. This book deals with the gay issue and how the bible talks about it and the persecution spread from the evangelical Christian church. But there is so much more related to rules and regulations that are relevant and not relevant for today. much is said about homosexuality I will not touch this at this point. But let me share some other thoughts. In Leviticus 18-20 condemns shaving,wearing mixed fabrics, getting tattoos, sowing different crops in the same field, sexual activity during a women’s period, man lying with a man. So if some of these rules applied today and others didn’t how do we decide which is which. So perhaps I should decide which rule was a cultural and which was a moral one, There is nothing in the old testament that differentiates between moral and cultural commandments. Romans2:1 O man every one of you who judges, for in passing judgement on another you pass judgement on yourself. ESV. This passages point is that all of us are sinners and need a savior. When we come to the new testament Titus 2:9 says slaves be subject to your masters, 1 Corinthians 14:34 women should be silent in church, 1 Corinthians 11:6 says if women does not cover her head she should have her hair cut off that would be a disgrace. Romans 13:1 Everyone must submit themselves to the governing authority for they are establishes by God. I don’t know any Christian who would argue for plain sense reading of these passages. Because none of us can be declared righteous based on our imperfect following of Gods law. Paul explains God offers us grace and a savior in the form of jesus freeing us from the burden of the law without giving us license to sin. In Romans 13:8-10 we read let no debt remain outstanding, except the continuing debt to love one another for he who has loved his fellowman has fulfilled the law. … Therefore the commandments are summed up in one rule “love your neighbor as yourself” love does no harm to his neighbor, Therefor Love is the fulfillment of the law. Agape Love, sugest a selfless, unconditional, sacrificial kind of love. a kind of love that seeks others good before his own. This kind of love is the fulfillment of Gods love, and it can be relied on in any situation. Truly living out Gods Agape love for others always leads to doing the right thing. Sin always results from selfish desire in one form or another. I conclude with this quote from Justin Lee if given a choice between the loving option and the unloving option isn’t it right to always do the loving thing? If love is the fulfillment of the law, shouldn’t that take precedence over everything else? I got most of this information from a book called Torn By Justin Lee There is so much more If There has been a spark of interest I recommend reading the book. Thanks for this comment, Larry! First, let me respond to the OT passages. If I understand you right, you are referring to the question about what a New Testament disciple should do with all the rules and regulations in the Old Testament. I have found no better answer to this than David Dorsey’s “Compromise”. Let me know what you think of the article, and if it answers the question of the OT. As for NT commands like “slaves submit to your masters”, as we said in sermon discussion group, we have to look at each command individually. What did the command mean in the original context? Was there a specific situation that the command was addressing? What other passages of Scripture might help us understand that command more fully? Is there a theological principle behind the command that is transferrable to today? The issue of slavery is a good case. Slavery in NT times in the Roman Empire was vastly different from what we typically think of when we think of slavery. We think of what happened in our nation’s history. While slavery is always wrong, and even in 1st Corinthians we saw how Paul advocated for slaves to get their freedom, in the Roman Empire slaves had way more opportunity to gain freedom, wealth, citizenship, status, etc. than the slaves in our nation’s history. So when Paul says “submit to your master” it is a vastly different context. I might disagree with what you say about Romans 13:1. Submitting to governing authority is almost always the best thing, and should generally be understood in the plain sense. The only exception to this is when the governing authority is requiring the Christian to act against the standards of discipleship to Jesus. Then we practice civil disobedience, in order to glorify the Lord. But we do not enter into that quickly or without much thought and prayer. I have read some of Torn, and I appreciate Lee’s heart, but I’m concerned about the level of scholarship he brings to his book. There were some places where he sounded authoritative, but his content lacked a substantial basis. I can’t speak confidently because I haven’t read the whole book, but I can say at least this, that I am concerned that he might not be a reliable guide. Let’s keep the discussion going! Thanks for raising questions. I always appreciate it!!! Thank you Joel for your thoughts in regards to my post. You are absolutely right about obeying the government. I failed to say except when it is against Gods word. I was thinking of those hid the Jews during world war two. If the government ask us to deny our faith, approve abortion etc. etc. That was what I was talking about. Would you agree that if we love God with all our hearts and our neighbor as ourselves we will be obeying all the laws we need to? Did Paul say in Gal. 5:13-14 that love sums up the law. Sin comes from selfishness not from selfless love? If given the option between the loving option and unloving option, Isn’t it always right to do the loving thing? If love is the fulfillment of the law , Should not that take precedence over everything else. I am not the smartest cookie in the flock but the article you sent me made my head spin. I did not count but there is so many options on what law is right for today, and what law we ignore Again does not agape love help us know what to do and how to act?. I do think that loving God and loving others sums it up. That was what Jesus said in Matthew 22. The tricky part is when not everyone agrees about what is the loving thing to do! And I know there are situations where “loving God, loving others” will likely not be enough information to know how to choose. It reminds me of the phrase What Would Jesus Do. People talked about that as the answer to everything. It is good to think what Jesus would do in a given situation, but that presupposes we know Jesus enough to know what he would actually do! I would add humility to the mix, a teachable spirit that says “I think I am making the right choice, the loving choice, but I may be wrong.” I also think at least a basic study of Christian Ethics is very helpful. Learning the biblical principles for godly decision making. Don’t worry about the article! Maybe you and I can talk about it further in person? Let me start out by saying that I appreciate both your desire for unity in the church, and your recognition that this is a subject that matters to God and it should matter to us as well. I appreciate you trying to tackle this issue even though it’s one that can be divisive. The reason I am mentioning anything in the comments here is because I’m worried that people may only learn about the complementarian position from these two posts and sermon (which I did listen to). You probably wouldn’t be too surprised to hear that I hold to the complementarian position. But to be honest, I didn’t recognize my position in these posts or in the sermon. You said that even the complementarian position is “motivated by a heart to honor the Lord,” but how can you reconcile that with the complementarian approach which supposedly “by its nature, lowers women?” I could not respect a position that actually believed women are lower than men. I would take exception to that misrepresentation of what a complementarian holds to. Thanks for replying, Brett! Good to hear from you. Thanks for pointing people to other perspectives. I was not trying to caricature complementarianism, and I apologize if I came across that way. I thought I did try to communicate how I have seen both men and women who hold to a complementarian view handle it in a loving way. Good question how I can reconcile a complementarian heart that is motivated by love for the Lord with the belief that complementarianism by nature lowers women. What I meant, and I apologize if I wasn’t clear enough, is that most complementarians I know are not actively seeking to lower women. They would agree with Paul who says elsewhere “in Christ there is no male or female” as referring to the equality of both in God’s eyes. A complementarian with a heart that loves the Lord would, in most cases, see themselves as simply trying to be faithful to the Lord and not lowering women. But complementarianism by its nature does lower women in a practical sense. In 1st Cor 11 and 14, in the church, and in other places, in marriage, Paul lowers women. (Personally, I am more inclined to see how people come to the complementarian view of marriage as for all time, as in Eph 4, than I am to see the complementarian view for women in ministry.) Perhaps here we need to make sure that we both understand the sense in which I use the word “lower”. I am not using it in negative sense because I don’t think Paul was. He was simply asking the women to abide by a culturally-sensitive understanding of gender roles so as not to diminish the church’s impact for Christ. I don’t believe Paul’s was a negative request. It is actually very positive, but it does in fact, in a practical way, put women in a lower position than men, and is a teaching that he did not apply at all times (as in Romans 16), and I don’t believe it is a position he would teach in an egalitarian society like ours. I hope that clarifies things a bit. Frankly, I’m concerned that not only is a complementarian approach in an egalitarian society not biblically necessary, but has potentially been a detriment to the mission of the Kingdom.I’m not trying to be disagreeable, by the way! I very much appreciate a healthy discussion. Hope you guys are doing well! How’s the garden this year??? You definitely left room for men and women who hold to the complementarian view to be loving people, and I appreciate that. I just wanted to clarify that it’s not in spite of their views that complementarians can be loving people but rather because of those views (properly held). It sounds like you’re clarifying “lower” as not meaning “lesser” which is what I was assuming you meant at first. Is there another word you would use besides lower to clarify that the distinction between the two views is not in regards to value but rather roles? You defined complementarianism as “women are to complement men,” but you could just as easily have said that complementarians hold that “men are to complement women.” Throughout the posts and sermon, there seemed to be several instances like this which made me wonder if you’re implying that we believe men’s roles are more valuable, important, or impressive to God than women’s roles are. If the role of men and women are truly to complement each other, both roles are necessary and important in the church. I wholeheartedly agree with you that teaching anything that is untrue is a hindrance to the gospel. So the question needs to remain: beyond what society thinks, what does the Bible teach us about men and women? And it’s at that point which we would still disagree. Thank you for clarifying some of that. And no worries about possibly coming across as ‘disagreeable,’ that’s certainly not the case. There are many issues that we’d disagree on but I really do appreciate you addressing tough topics as they’ve come up in 1 Corinthians. That’s got to be one of the cool things about preaching through an entire book of the Bible, no way to avoid some tough issues. Thanks Brett. And thanks for waiting for a reply! Great discussion. I think you’ve described well our varying points of view on the issues. Good question about another word I would use rather than “lower”. Perhaps a better description would be “equal” vs. “non-equal” in their roles in the church. I am bit hesitant about “equal” or “non-equal” because I don’t feel it fully enough describes how complementarianism gives men full access to the life of the church, but limits women. (I’m not trying to caricature complementarianism by saying that previous sentence. I’m simply trying to describe how complementarianism views men and women differently as it pertains to their role in the church.) I feel “lower” preserves that limiting sense a bit better, but I also see, if I understand you right, how “lower” could come across unnecessarily negative. I hear you about 1 Corinthians. I knew as soon as I picked to go through it, that I’d be dealing with some hot topics. But isn’t it amazing how relevant Paul’s letter is to the American church in 2014? I read both the post and it’s comments. There’s another cultural consideration – back in the day, gender segregation was a fact of life. Even the Temple had a court of the women, court of the men, court of the gentile – beyond which certain people couldn’t go. They could only get so close and it was only through their husbands could a woman get to God, it was only through their husband’s bringing a sacrifice that could she be saved. This made me wonder why complementarianism’s division is more like: male-leader is the complement of female-follower; why isn’t it the other way around? male-follower as the complement of female-leader? When I read about Clement being instructed to make a copy of the letter he had received and to give it to a woman named Grapte who would exhort the widows and orphans, I realized that this group didn’t have any husband/fathers through whom these low-status people could go through to get to God. The “hierarchy” of God > Christ > Man/Husband > Woman/Wife fails in that context. Today, a great many complementarians unintentionally marginalize women who have no men to go through to get to Christ – a theology that says that one gender complements the other has very little encouragement to give singles other than to hurry up and marry so that they will be a whole person.